World No. 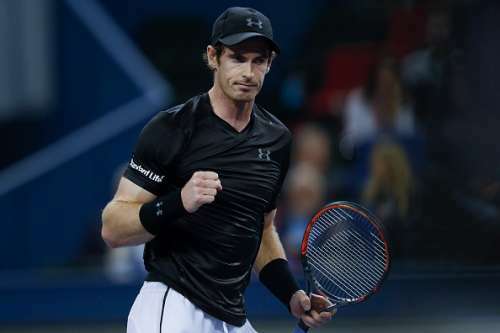 2 Andy Murray beat Gilles Simon of France in straight sets – 6-3, 6-4, to progress to the finals of the Shanghai Rolex Masters, the penultimate masters event of 2016. Murray saw his serve broken by Simon in the very first game of the match, with Simon then holding quickly to take a 2-0 lead. The pair engaged in some quality rallies, but stuck to the baseline for the majority of the first set. The Scot put some excellent strategy and shot-making on display, with both forehand and backhand in full form; the No. 2 seed outwitted a quick Simon on multiple occasions, forcing the Frenchman to rethink his own gameplay throughout the match. The level of strategy in Murray’s game was reminiscent of Roger Federer in his heyday, or even Novak Djokovic in his Australian Open final against Jo-Wilfried Tsonga in 2008. Going further through that set, however, Murray did not appear to be seriously affected by Simon’s early break; although he committed a mammoth 18 unforced errors in the set, he would go on to win it 6-4 in 40 minutes. Serving to begin the second set, Murray quickly broke his rival with a close miss from Simon, but the Frenchman took his rival to break point immediately in the next game – with Murray managing to save that break for a 3-0 lead in the second. Poised at 5-1 and looking to wrap up the match as Simon served to stay in it, the Frenchman broke the World No. 2 to go up 2-5 and then quickly built on that break to reduce his deficit to 3-5 with some terrific groundstrokes. Simon appeared to lose some of the nerves that seemed to hit him in waiting to serve for the match, freeing up his game significantly. In the end, Murray took one hour, 43 minutes to dispatch Gilles Simon 6-4, 6-3, committing a whopping 30 unforced errors along the way. The Scot was able to pick up his game significantly in the second set, but saw strong competition in the form of Simon, who did not by any means go out with a whimper, putting up a far stronger show than the scorelines might suggest. Elsewhere, and in perhaps the upset of the tournament, Spanish 15th seed Roberto Bautista Agut ousted top seed and defending champion Novak Djokovic in straight sets – 6-4, 6-4, to make his first ever ATP Masters final, marking his first ever win against a World No. 1. Andy Murray has long been pipped to chase Djokovic for the World No. 1 title, and with perhaps the best consistency among the current ATP crop and a number of patchy performances from the struggling Serb, could well reach that title in 2017. Murray will play Roberto Bautista Agut in the finals tomorrow; the pair have played each other twice before, once at Wimbledon in 2014, and in Munich last year; Murray beat the Spaniard in straight sets on both occasions and given his form, will likely be expected to win tomorrow’s final. Bautista Agut will play his first ever ATP Masters final tomorrow.